Holiday insurance is a vital part of the holiday experience, without it you leave yourself at risk if anything was to go wrong. 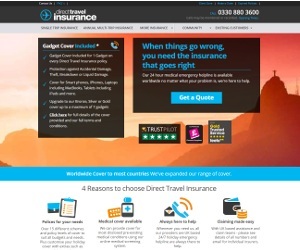 Direct Travel Insurance offer competitive quotes on various types of popular travel. Whether you are going on a single trip, annual multi-trip or a more specific type of holiday, like skiing, Direct Travel will have you covered. We all have various gadgets these days, the average smartphone costs over £500. It is important that you protect these gadgets from unwanted eyes. Direct Travel include ‘Gadget Cover’ which gives protection against Accidental Damage, Theft or Breakdown. Its a popular feature of their policies.